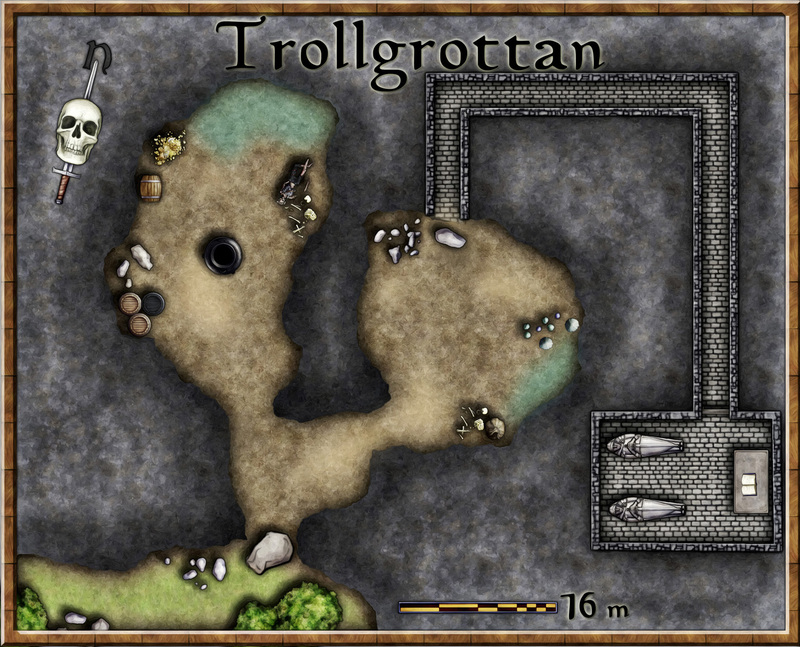 As I have stated earlier one of the great things with Dungeon designer 3 (DD3) from Profantasy is that you can make a nice map in a very short time. Whenever I decide to play an adventure with my children I try to make up the basics of the story together with them. It is a great way of getting them involved in the creative process, and they also think it is more fun when they feel that they can influence the story. This time me and my daughter started to talk about trolls and I asked her if she thought there be Trolls nearby the castle where her character lives (of course she plays a princess). And she said that there might be. I told her that I’d heard some of the farmers complaining about trolls attacking people and livestock and that maybe someone should look into it. She really hooked into the story and started to make up things herself and now she insists on that we have to play on Saturday, because someone has to stop those trolls. 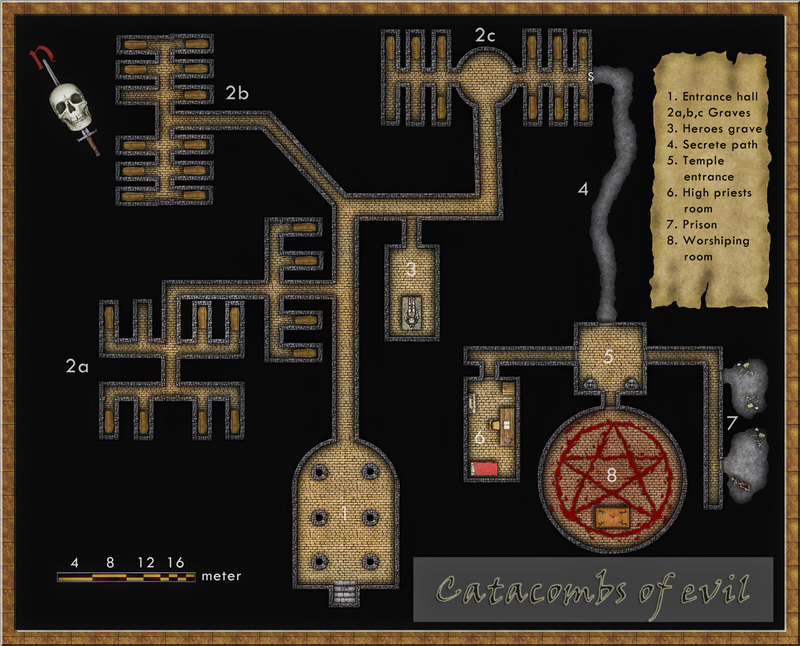 Well suddenly I had to come up with a map we can use on Saturday, and as I said in the beginning of this post, making dungeons in DD3 is a real treat. The map below took me around two hours to complete from scratch to finished product. The map is completely done in DD3 but labeling and some effects to make it more paint looking where all applied in Photoshop. Now I just need to wait for Saturday and see if the princess can defeat all the trolls that harass the neighborhood. The earlier maps of the Etrakien world that I made had a brighter colour scheme than I wanted. It didn’t fit in to the setting I had in mind for the world, a hard and bloody place full of struggle and war where the civilized world never was more than a few steps from falling into chaos. 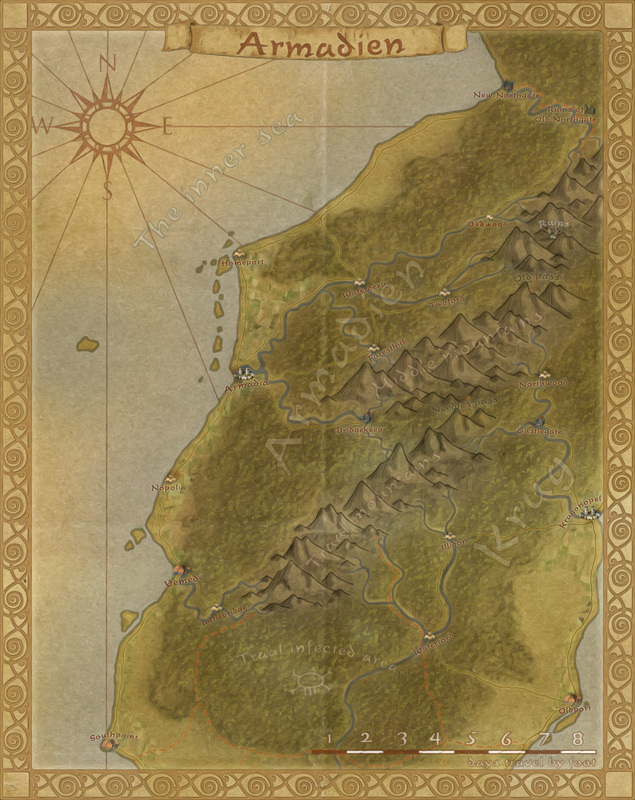 When I remade the Etrakien world map I went for a darker colour scheme and I also wanted the map to look more authentic, like a real map from lost times. When I was satisfied with the world map I decided to test the style on a more regional level. 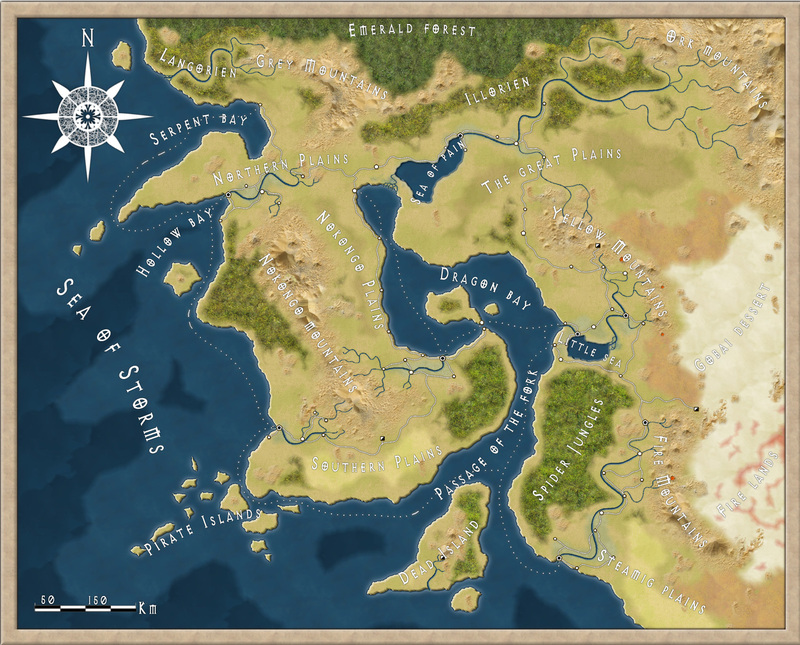 The first map in the style, that later went on to be the style that I used in both the map of the Truscian peninsula and the Serpents bay, is a map of the Armadien kingdom, a place a bit north of Ankh-Bathor. 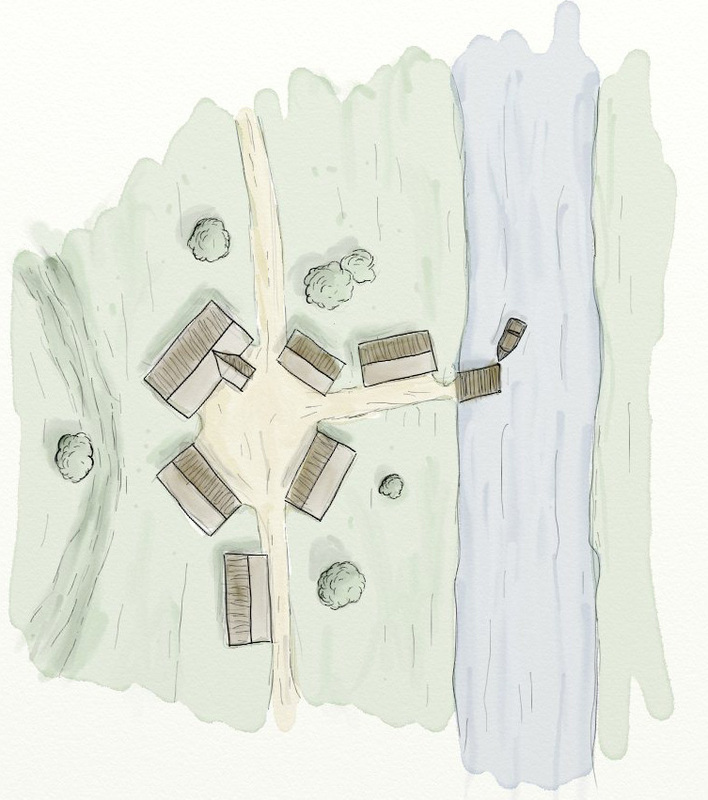 As usual when I make a map I tried to make up a story around the place before starting out. The story however tends to change as soon as I start to draw, but that is part of the fun. Armadien is a kingdom ruled by a weak king that is in the hands of the twelve lords that each are in charge of different parts of the country. The twelve lords are constantly forming alliances between each other and are breaking them as often. At the moment they are in a dispute with Ankh-Bathor in the south since the Armadien army conquered the free city Southpoint. Southpoint was a close ally to Ankh-Bathor because through the city Ankh-Bathor could avoid Armadiens tolls on timber. Armadien are by many referred to as the Forest kingdom, and the timber produced here are among the best in the whole world. So Armadien decided to once and for all stop the trade between Southpoint and Ankh-Bathor and conquered the city. But Ankh-Bathor is a very powerful city state that doesn’t like that someone meddles in its affairs so at the same time Armadien also formed an alliance with the Etrakien Empire in the south, who thinks that Ankh-Bator is nothing more than a part of its empire that against its people’s wishes has broken free. Ankh-Bathor knows that the Etrakien Empire is just waiting for an excuse to try to reclaim the city, and a war on two fronts is not something you wish for. So in this way Armadien thought that they could avoid a counterblow from the powerful city, they couldn’t have been more wrong. In the southern part of the great Armadien forest there is an area people say is a part of the old forest that once covered the whole world. It is a sinister and dark place where the sun seldom has the strength to reach below the crowns of the trees. This is also one of the last places where you can find Traals in the civilized world that are not enslaved. Traals are a humanoid race far stronger then the humans, but inferior when it comes to technology and for a long time they have been forced to live in parts of the world where the humans make no claim of the land. Ankh-Bathor has through a dummy started to equip the Traals in Armadien with steel weapons in a hope that an uprising will start that will occupy the Armadien army to such a degree that Southpoint will be able to break free from its oppressor. The problem though is that it is quite hard to control the Traals and at the moment the weapons trade has mainly resulted in a civil war among the Traals.